Olympic athletes, from left, Kerri Walsh Jennings, Simone Biles, and Michael Phelps. Michael Phelps is a household name. In the next month, Simone Biles may become one. Phelps, the most decorated Olympian of all time with 22 medals, has dominated four Olympics and come out of retirement in hopes of sweeping a fifth. It's likely to be his final Games. Biles is on the other end of her career, but with similar expectations. The 19-year-old gymnast heads into her first Olympics with 14 world championship medals under her belt, 10 of them gold. The budding superstar is undefeated in the all-around and has been called "unbeatable" by gymnastics legend Mary Lou Retton. Phelps and Biles are among more than 550 athletes who will represent Team USA in Rio, including 292 women, the most in Olympic history to ever compete for a single country. Of Team USA's 68 returning champions, 53 are looking to defend titles won during the 2012 London Games. 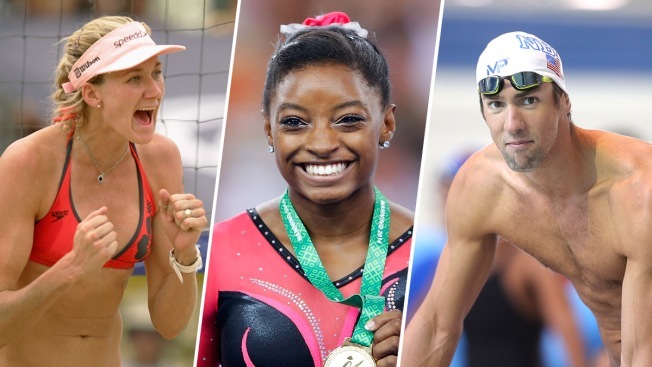 Here's a look at the American athletes to watch during the 2016 Rio Olympics. At 31 years old, Phelps has 18 gold medals among the 22 medals he's earned in four Olympics. He set an Olympic record by taking home eight gold medals in Beijing in 2008 and is the first American swimmer to qualify for five Olympic Games. He holds multiple world records and became the youngest male swimmer to break one at the age of 15. In August, Phelps clocked three of the year's fastest times. Born in Baltimore, Maryland, Phelps will compete in the 100- and 200-meter butterfly and 200-meter individual medley. Ryan Lochte, 31, has won 11 medals in three Olympics: five gold, three silver and three bronze. He has also taken home an impressive 62 world championship medals, including 36 gold. Lochte, who has set both individual and team world records, will compete in the 200-meter individual medley and the 4x200-meter freestyle. Rio will mark the third Olympics for swimmer Nathan Adrian, who took home two gold medals and a silver in Beijing and London. With a time of 21.37 seconds, he holds the American record for fastest 50-meter freestyle. Missy Franklin, the 21-year-old darling of the women's team, won four gold medals and a bronze in London. 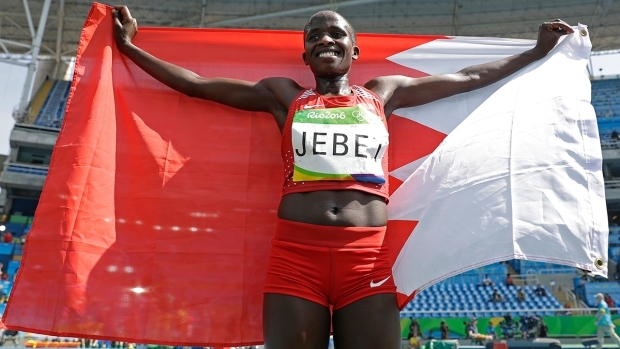 She has also taken home 17 world championship medals, including 11 gold, three silver and three bronze. Franklin, who grew up in Colorado and attended the University of California at Berkeley, will compete in the 200-meter backstroke, 200-meter freestyle and 4x200-meter freestyle. Teammate Dana Vollmer, who has won four Olympic gold medals, will be competing in her third Games. She was back in the pool two months after giving birth to her first child last March. Katie Ledecky, 19, will compete in her second Olympics. The Bethesda, Maryland, native won gold in London and has taken home nine world championship gold medals. Biles may be only 19, but her 10 golds at the World Championships are the most of any female gymnast. She's one of just three women in history to win four straight all-around titles at the P&G Gymnastics Championships, according to NBC Olympics. A native of Spring, Texas, Biles has also won the most world medals in U.S. history. The most decorated U.S. gymnast in London, teammate Aly Raisman returns to defend her titles. The Needham, Massachusetts, native took home two gold medals and one bronze and was fourth all-around. She has also won four world championship medals: two gold, one silver and one bronze. Also competing in her second Olympics is Gabby Douglas, who won all-around gold in London at the age of 16. Douglas, a Virginia native who lives in Los Angeles, won team gold at the 2011 and 2015 world championships and took home all-around silver last year. Olympic newcomers Madison Kocian, a 19-year-old three-time world championship gold medalist, and Laurie Hernandez, 16, round out the women's team. Leading the men's team is 23-year-old Sam Mikulak, who will compete in his second Olympics. From Newport Beach, California, Mikulak placed fifth in team vault in London and won bronze at the 2014 world championship. He took home two two gold medals and two bronze at the 2015 Pan American Games. Also returning for his second Olympics is Jake Dalton, a 24-year-old native of Reno, Nevada, who attended the University of Oklahoma. Dalton has won four medals in four world championships. He did not medal in London. London alternates Alex Naddour and Chris Brooks will also compete for Team USA, along with 2012 team member Danell Leyva. Leyva replaces John Orozco, who qualified for Rio after tearing his Achilles tendon, only to injure his ACL in June and withdraw from the team. 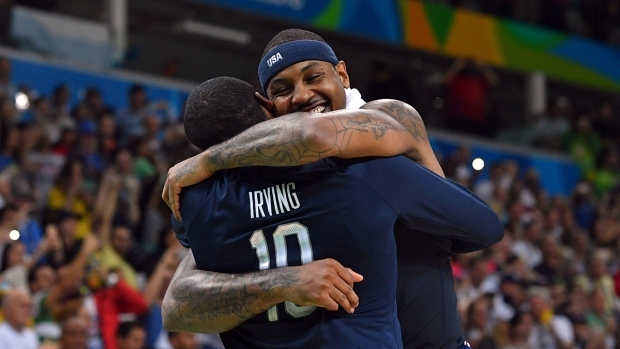 Rio will mark the fourth Olympics for New York Knicks forward Carmelo Anthony, the only U.S. men's basketball player in history to qualify for four Games. Anthony, 32, has won two Olympic gold medals and one bronze. He set a Team USA single-game scoring record in London with 37 points against Nigeria and took home bronze in the 2006 world championship. Kevin Durant, 27, of the Golden State Warriors, will compete in his second Olympics. A member of the 2012 gold medal team, Durant was named MVP of the 2010 world championship game and was selected to play on that year's All-World Championship Team. Indiana Pacers guard Paul George, 25, will compete in his first Olympics after overcoming a horrific leg injury, which caused him to miss most of the 2015 season. George's right tibia and fibula snapped on the court during the 2014 USA Basketball Showcase, stunning teammates and spectators alike. The NBA All-Star has made a full recovery and is expected to serve as a key member of the team in Rio. The powerhouse U.S. women's basketball team includes half a dozen players from the University of Connecticut, a force to be reckoned with in the world of college basketball. Former UConn stars Sue Bird, Diana Taurasi, Maya Moore and Tina Charles will help lead the team. Joining them is recent UConn graduate and Olympic newcomer Breanna Stewart, who went to the Seattle Storm as the No. 1 WNBA draft pick in 2016. Three-time Olympic gold medalist Tamika Catchings, 37, will also compete. The Indiana Fever forward and Duncanville, Texas, native has played in three world championships, earning two gold medals and a bronze. She's one of only nine players in history to have won an Olympic gold medal, world championship gold medal, NCAA title and WNBA championship, according to USA Basketball. Champion sprinter Allyson Felix, 30, returns to compete in her fourth Olympics. The Los Angeles native has won four gold medals — three in London and one in Beijing — and two silver medals. She has also medaled 13 times in seven world championships and was named 2012 IAFF World Athlete of the Year. Felix, who fought through an ankle injury during the Rio trials, fell a hundredth of a second shy of qualifying for the 200-meter dash — her first failure to qualify since she was 15 years old, according to NBC Sports. She will compete in the 400-meter and 4x400-meter dash. Tianna Bartoletta, 30, will compete in the 100-meter dash and long jump. She won gold in the 4x100-meters during the 2012 London Games and has competed in six world championships, earning five gold medals and two bronze. Bartoletta also competed in 2012 for the U.S. national bobsled team alongside fellow track and field Olympian Lolo Jones. She took bronze in the 2012 bobsledding World Cup. Devon Allen, 21, is a new face in the Olympic crowd. A wide receiver and runner at the University of Oregon, Allen has competed in three NCAA Indoor Track and Field Championships and one outdoor championship. He'll run the 110-meter hurdles in Rio. Distance runner Galen Rupp, 30, qualified for Rio by winning the U.S. Olympic marathon trials in his first ever 26.2-mile race. He competed in both Beijing and London, where he took home silver in the 10,000-meter, becoming the first American to medal in that event since 1964. The five-time USA Outdoor champion has competed in six world championships, with a top finish of fourth in 2013. At age 41, Meb Keflezighi is the oldest American man to run the Olympic marathon the only one to make three Olympic teams. He won the 2014 Boston Marathon and 2009 New York City Marathon and the American record for the 20-kilometer. Keflezighi has competed in two world championships. Co-captain and midfielder Carli Lloyd, 34, hopes to clinch a third consecutive Olympic gold medal. Lloyd scored the game-winning goal in the 2008 gold-medal match against Brazil and netted both goals in Team USA's 2-1 victory over Japan in 2012. The New Jersey native has also won two world championship medals and in 2015 became the first player in team history to score in four consecutive FIFA World Cup games. Despite concerns about the Zika virus, record-setting goalkeeper Hope Solo will join her team in Rio to compete in her third Olympic games. She won gold in both Beijing and London and served as an alternate in Athens in 2004. 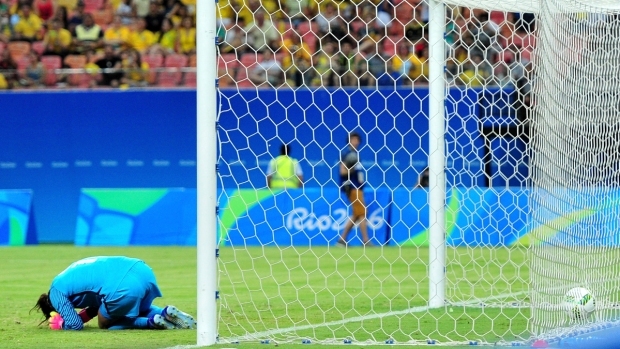 Solo is a FIFA World Cup Golden Glove Award winner and a member of the 2015 FIFA Women’s World Cup All-Star Team. Rio will be the second Olympics for 27-year-old forward Alex Morgan, who scored three goals in London, one of which sent Team USA to the gold-medal match. Morgan graduated early from the University of California at Berkeley and plays for the Orlando Pride. Midfielder Megan Rapinoe was a toss up for Team USA after tearing her ACL last December, but recovered to qualify for her second Olympic Games. Rapinoe, 31, was a member of the U.S. women's national team when it won the World Cup in 2015 and was selected to the 2015 FIFA Women’s World Cup All-Star Team. The U.S. men's soccer team did not qualify to compete in Rio. Beach volleyball champ Kerri Walsh-Jennings, 37, heads to Rio for her fifth Olympics without her partner of 11 years, Misty Mae-Treanor, who retired to start a family after the 2012 games. Together, the two won 21 consecutive Olympic matches and lost only one set — to Austria in 2012. Walsh-Jennings won gold in the 2004, 2008 and 2012 Games and will have the No. 3 seed in Rio with partner April Ross, whom she defeated in London. Water polo captain Tony Azevedo will also compete in his fifth Olympics. The 34-year-old native of Brazil in 2012 became the first American men's water polo player to compete in four Olympics, along with teammate Ryan Bailey. Azevedo won a silver medal in Beijing and took gold in five Pan American Games. He has competed in eight world championships. Dominant forces on the tennis court, sisters Serena and Venus Williams will take their talents to Rio to compete in their fourth and fifth Olympics, respectively. Together they are unstoppable, making the winningest doubles team in Olympic history. They go into the games with a perfect 15-0 doubles record and seek to tie the record for overall tennis medals — five. Equestrian Phillip Dutton is one of only a handful of athletes in Team USA history to compete in the Olympics for a sixth time. At age 52, he is also the oldest athlete on Team USA. Dutton has won two Olympic gold medals and competed in six world championships. He moved from his native Australia to the U.S. in 1991 and became a citizen in 2006. The youngest member of Team USA, 16-year-old Kanak Jha, will compete in table tennis. The first-time Olympian has won multiple national titles and became the youngest ever World Cup participant in 2014. First-time Olympic golfer Bubba Watson, has nine tournament victories under his belt, most recently the 2016 Northern Trust Open and the 2015 Travelers Championship. Watson, 37, has represented the U.S. three times in the Ryder Cup and twice in the Presidents Cup. The women's rowing team heads to Rio with 10 consecutive world titles under its belt and a reputation for being one of the best sports teams in history, according to NBC Olympics. Leading the women's eight are third-time Olympian Eleanor Logan and second-time Olympian Meghan Musnicki, both members of the 2012 gold medal team. They're joined by coxswain Katelin Snyder, Amanda Elmore, Tessa Gobbo, Emily Regan, Lauren Schmetterling, Amanda Polk and Kerry Simmonds.